Woot, woot! Wednesday this past week I got to start another build. This time around I am building a Seamaster. This build has taken some time to get started with all the major life changes that happened over this winter and some hiccups in the creation of the kit itself. This kit is no longer manufactured so someone Peter knows out of Winnipeg cut the kit for me, so a big thank-you to him! I got to see the pieces for the first time Wednesday. This will be my first seaplane and I’m excited to experiencing taking off / landing and flying over water. I’m getting ahead of myself though as I need to build the aircraft first! To start I read through the introduction of the manual Peter wrote up along with the first bit on the fuselage. I then laid out the plans on the table, covered it, and pinned it all in place. 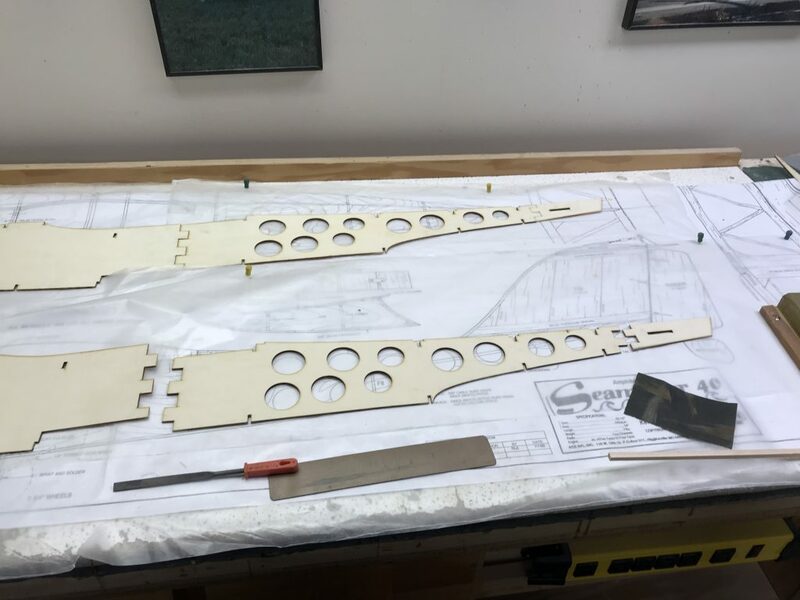 I found the 6 pieces making up each side of the fuselage and laid them out. You can see the front portion laid out in the image at the top of the post and the back portion of the fuselage sides in the image at the bottom of the post. Due to the kits being laser cut the first step is always to do lots of sanding! Which is what I did most of this day, was sanding all the edges to get rid of the ‘laser burns’ and give a better edge for the glue hold and allow the pieces to stick together (as shown in the top 3 pieces). Now to reading the manual I go!